Our tour of the world’s wines, making our way around the island of Manhattan, next included the Jean Bourdy Cremant de Jura – a 100% chardonnay from Jura, France. This white was matched up with the Delice D’Bourgogne, a cheese from Burgandy, France. Produced by Fromagerie Lincet, the pasteurized triple creme (75% butterfat in dry matter) marries full-fat cow milk with fresh cream, producing a rich, whipped cheese with a thin, pungent mold rind that imparted some great smells (“straw and mushroom aromas, complementing the buttery, yellow, sweet cream interior” according to our learned guide) to all of us enjoying the pairing. At first I wasn’t sure what smell I detected in the JBC but, when prompted by our hostess, I definitely got a feel for the nutty, fruit-tinged aroma she described. 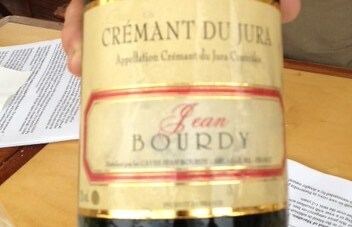 The Jean Bourdy Cremant de Jura, a 100% chardonnay from Jura, France. How’s that for some good wine-speak??! Just one more pairing still to go after this one as we pass the History Channel sign along the river. This entry was posted in Chardonnay and tagged France.